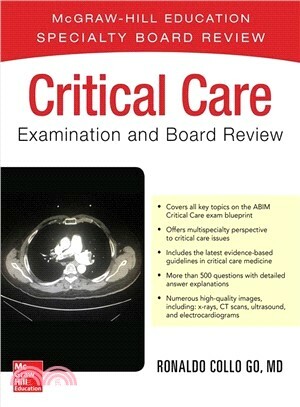 McGraw-Hill Education Specialty Board Review: Critical Care Medicine is an evidence-based multidisciplinary perspective to critical care medicine. The format of each chapter consists of text followed by questions and answers. Authors from major academic centers discuss the basic principles of their field, along with the most recent studies. This unique review reflects the author’s belief that competency in critical care medicine is derived from multiple factors: an understanding of the basics of medicine, access to the most current evidence, clinical experience, and openness to palliative care. Ronaldo Collo Go, MD is a pulmonologist and critical care specialist who's board-certified in internal medicine, pulmonary medicine, and critical care medicine. He currently works for Crystal Run Healthcare in Middletown, NY, and is affiliated with Orange Regional Medical Center. He also edited Pulmonary Disease Exam and Board Review, published by McGraw-Hill Education in 2016.